This collection of original essays by preeminent interpreters of continental philosophy explores the question of whether Western thought and culture have been dominated by a vision-centered paradigm of knowledge, ethics, and power. It focuses on the character of vision in modern philosophy and on arguments for and against the view that contemporary life and thought are distinctively "ocularcentric." 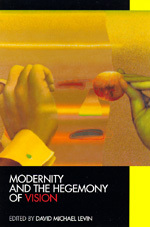 The authors examine these ideas in the context of the history of philosophy and consider the character of visual discourse in the writings of Plato, Descartes, Hegel, Nietzsche, Husserl, Heidegger, Benjamin, Sartre, Merleau-Ponty, Levinas, Derrida, Foucault, Gadamer, Wittgenstein, and Habermas. With essays on television, the visual arts, and feminism, the book will interest readers in cultural studies, gender studies, and art history as well as philosophers. David Michael Levin is Senior Professor of Philosophy at Northwestern University. His most recent book is The Listening Self (1989).